When providing information to the LLA Hotline, please include sufficient detail (describing who, what, where, when, why and how) to allow them to fully evaluate your information. Although they will consider anonymous information, providing them with you name and telephone number will allow them to conact you with any additional questions that they have. Your name and telephone number, as well as the staus of complaints, are confidential. 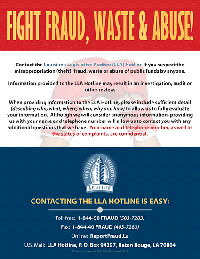 For more information contact the LLA Hotline at the number or link posted below.